Posted on 14/07/2015. Last edited 2 days, 21 hours ago. Posted on 14/07/2015. Last edited on 16/06/2016. I’m conscious of my time…and can see how to engage in my morning. I love how I create more ease for my day. I naturally take excellent care of myself. I see this day as new. This day has a clean slate & I choose inner wealth. I love my body and all that it does for me. I choose to radiate love, joy and gratitude today. I know life is too short to dwell on negativity. I walk in the light. Gratitude brings me into a harmonious relationship with the good in everyone that surrounds me. Posted on 27/07/2015. Last edited on 01/09/2015. Posted on 27/07/2015. Last edited on 18/08/2015. My life is absolutely wonderful in all aspects, I am so grateful. My future is glorious. I now live in limitless joy, light and love. All is well in my world. This Moment is filled with joy.I Now choose to experience the sweetness of today. Posted on 31/07/2015. Last edited on 17/08/2015. I use all of my experiences and knowledge to benefit my Life and others. Posted on 01/08/2015. Last edited on 18/08/2015. Everyday brings me great joy. I am so grateful for every person and every thing in my life. Posted on 04/08/2015. Last edited on 27/08/2015. I am grateful for all the positive things that are still yet to come my way. I clearly see the beauty of life that flourishes around me. Posted on 14/08/2015. Last edited on 02/05/2016. I the one I am waiting for. I am the change I seek. I am a woman of vision and action. Success is the outcome of whatever I do. I am blossoming like a beautiful rose spreading the lovely fragrance of happiness and kindness wherever I go. Like a child’s innocent smile all lit up…I too reclaim my joyful innocence and take pleasure noticing the fresh new wonders of everything all around me. Like a beacon in the night, I generate rays of positive energy into the Universe. I am grateful to everyone! Posted on 23/08/2015. Last edited on 09/02/2016. I marvel at Life and am filled with joy! The presence of deep abiding love covers every fiber of my being. I am filled with joy. When I allow & experience life , I find that everything I want and need is actually there already, waiting for me to recognize its current available potential. Posted on 25/08/2015. Last edited on 20/09/2015. Today, all the right actions and all the right people are available; we all serve one another needs!! Together, we get things done! I release joy, compassion and hope into the Universe. I am filled with grace, peace and understanding which I readily release, the power of love unto the Universe. I am now absolutely clear about the specific types of results I want in every area of my life. I now celebrate the achievement of my goals before they occur in the physical world; they’ve already gotten the OK from the Universe. Posted on 28/08/2015. Last edited on 01/09/2015. Love and wisdom are are melded in my being, expressing perfectly through every phase of my life now. I exercise my body,mind and spirit in fun,enjoyable, life affirming ways. Every day, in every way, I am getting better and better…and better. Posted on 28/08/2015. Last edited on 31/10/2015. I allow goodness and harmony to come into my life. The perfect job, the right people, the exact circumstance are all instantly available to me, and all of my needs are met! I listen to people, as they open their heart and they tell me their truth. I am grounded in peace and in gratitude. Posted on 29/08/2015. Last edited on 03/09/2015. I choose to let go of attachments, and to open my heart, open the center and unblock to flow of love, compassion and abundance. I choose forgiveness, no matter what it costs, I’m worth MORE. I allow my heart to be softened and I open to miracles, everywhere, healing, with every breath, with every thought… with every good deed. I am free! My mind is free! I am grateful, so grateful! I glow with gratitude surging through my body mixed with sheer joy in my heart. I am showered with Blessings, falling like the gentle rain. I feel light as a feather, in perfect balance and harmony with the magnificent flow of life. Posted on 03/09/2015. Last edited on 07/12/2017. I breathe in all Blessings that abundantly permeate the Universe and exhale gratitude to share with others in order to continue the flow of Blessings and enrich their lives. Continuing the dynamic flow of positive energy. Today is complete; I allow the beauty of self discovery and life discovery, and I experience awesome levels of inner joy in the process. I am complete; all outside wonderful experiences are icing on the cake. I am a Blessing to all, sharing smiles, encouraging laughter and spreading love and kindness through words that speak only of the joys of life. I am having an absolutely spectacular day in which everything is magically going my way. Posted on 15/09/2015. Last edited on 07/12/2017. Everything is going absolutely wonderfully! My life is working out perfectly! I am whole and I am complete. I am in the right place at the right time with all the right people. I was born to Live and to Love! loving this thread everyone! (: Did I say that already?(:! Loving the projects related to taking time to organize and plan. I’m worth it. I look and feel younger and healthier each day. I am in awe and filled with absolute joy and delight of this treasured gift called life. This was a cassette I bought before cd’s were invented. Posted on 17/09/2015. Last edited on 07/12/2017. I am learning new ways of doing things. 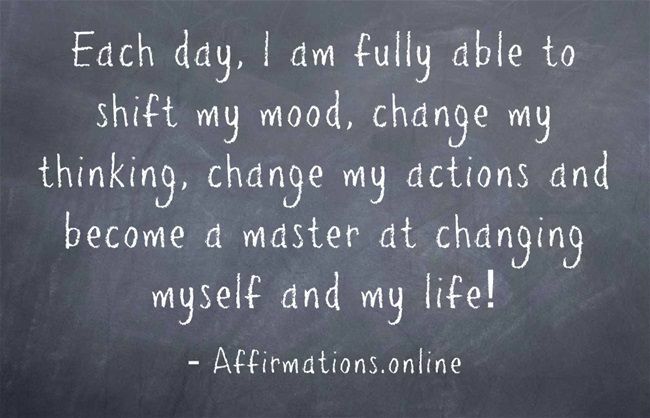 I am no longer afraid to use the power within me to achieve my highest good. I love myself and the more I love myself, the more beautiful I become! I take time everyday to laugh and enjoy all that that life is giving! I am balanced and I love taking care of my health and my well being! I am grateful for all of the good that is happening in and all around me! My life rocks!! Everything is working beautifully for my greater good, I am filled with light and laughter. I bask in sheer joy at the ability to experience the dawn of a new day and all the miracles that await. Share my talents, gifts and Blessings with the world in order to be a Blessing to others. Living and abiding in Love. Today I give myself 100 reasons to smile. Dynamically moving forth with grace and gratitude. Bask in the joy of sheer gratitude for the gift of this day! Posted on 06/10/2015. Last edited on 09/10/2015. Posted on 22/10/2015. Last edited on 27/10/2015. I am ease, and focus on areas that I joyfully choose. I am grateful and appreciative for wonderful music. Enjoying every bliss filled moment of life. I love this day!!!! I’m filled with giggles and gratitude!! I go beyond limiting beliefs and I accept my Self completely. I am willing to prosper from everything, including times of great difficulty and/or criticism. Unlimited Abundance is coming my way! I am engaging in work that impacts the world in a positive way!!! I have found a place inside where Nothing is impossible. I enter this inner space, where all things are created, nurtured and renewed. There is an inner wealth, a Great Luminous Mystery, and in this immense presence, I heal my Self and I heal the world. To see the beauty I want to see in the world, I must first see it in me. Today I see it clearly! Today I will be a beacon of positive energy, love and light. My Spark will flow freely and boundlessly to all who know me and encounter me. And so it is! Posted on 06/12/2015. Last edited on 04/04/2016. i relax and find ease in my attitude of trust. Amazing things are happening to me, the likes of which i have never seen before. My life will simply be as good as i allow it to be. I am in exactly the right place and it is getting better and better each day. Acceptance is the key and it begins with me. When i focus on the good the good gets better. Posted on 04/03/2016. Last edited on 07/03/2016. I am meant to live an expansive, exhilarating, good feeling experience. Like the air that I breathe ABUNDANCE in all things is available to me. Posted on 21/03/2016. Last edited 2 days, 20 hours ago. Posted on 12/05/2018. Last edited 2 days, 20 hours ago. Posted on 12/05/2018. Last edited on 28/11/2018. Posted on 06/06/2018. Last edited 2 days, 20 hours ago. I AM living a life of design. Posted on 04/11/2018. Last edited 2 days, 20 hours ago. Posted on 07/11/2018. Last edited 2 days, 20 hours ago. Posted on 15/11/2018. Last edited 2 days, 20 hours ago. I am enjoying the energy of this moment. Posted on 22/11/2018. Last edited 2 days, 20 hours ago. Posted on 17/12/2018. Last edited 2 days, 20 hours ago. Posted on 26/12/2018. Last edited 2 days, 20 hours ago. Posted on 26/12/2018. Last edited on 27/12/2018. in the time-frame I love. Posted on 01/01/2019. Last edited on 02/01/2019. Posted on 05/01/2019. Last edited 2 days, 20 hours ago. Posted on 09/01/2019. Last edited 2 days, 20 hours ago. Posted on 03/02/2019. Last edited 2 days, 20 hours ago. Great video of affirmations for International Women's Day!